Feature:Solid color.V neck.Long sleeve.Cuffs, collar, hem are elastic rib fabric.Lining is 100% polyester.Casual sequined baseball service. Material:100%Polyester.Our Material is very Soft and Lightweight.And It Looks Very Shining. 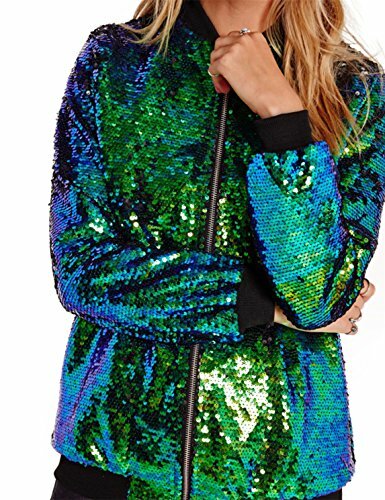 Focus:Classic single product and the trend of sequins element fusion, Reveals a shiny sequins in the sports and leisure style jacket on the wanton sway, full of chic attitude and publicity charm! So that wherever you go is the most shining. Garment Care:Hand-wash and Machine washable,Wash with the cold water.Dry Clean. NOTES:Asian size is usually smaller than western size.Plz read the Size Measurement Below.To be safe,u can order one size up! If you have any questions about this product by HAOYIHUI, contact us by completing and submitting the form below. If you are looking for a specif part number, please include it with your message.